The Japanese operation included two seaborne invasion forces, a minor one targeting Tulagi, in the Southern Solomons, and the main one aimed at Port Moresby. These would be supported by land-based airpower from bases to the north and by two naval forces containing a small aircraft carrier, several cruisers, seaplane tenders and gunboats. More distant cover would be provided by the big aircraft carriers Shokaku and Zuikaku with their escorting cruisers and destroyers. The U.S. Navy, tipped off to the enemy plans by superior communications intelligence, countered with two of its own carriers, plus cruisers (including two from the Australian Navy), destroyers, submarines, land-based bombers and patrol seaplanes. Preliminary operations on 3-6 May and two days of active carrier combat on 7-8 May cost the United States one aircraft carrier, a destroyer and one of its very valuable fleet oilers, plus damage to the second carrier. However, the Japanese were forced to cancel their Port Moresby seaborne invasion. In the fighting, they lost a light carrier, a destroyer and some smaller ships. 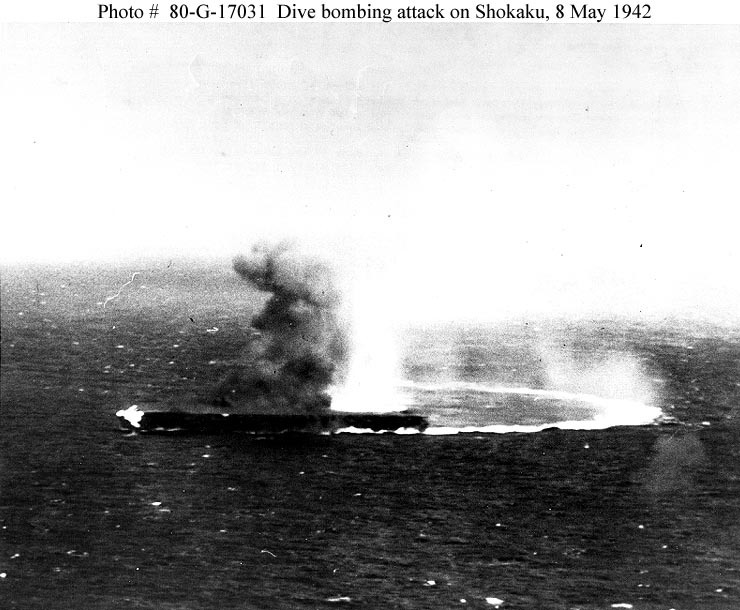 Shokaku received serious bomb damage and Zuikaku's air group was badly depleted. 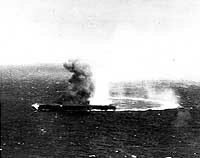 Most importantly, those two carriers were eliminated from the upcoming Midway operation, contributing by their absence to that terrible Japanese defeat. 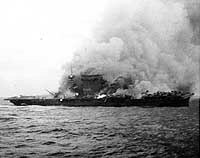 The Events of 8 May 1942. 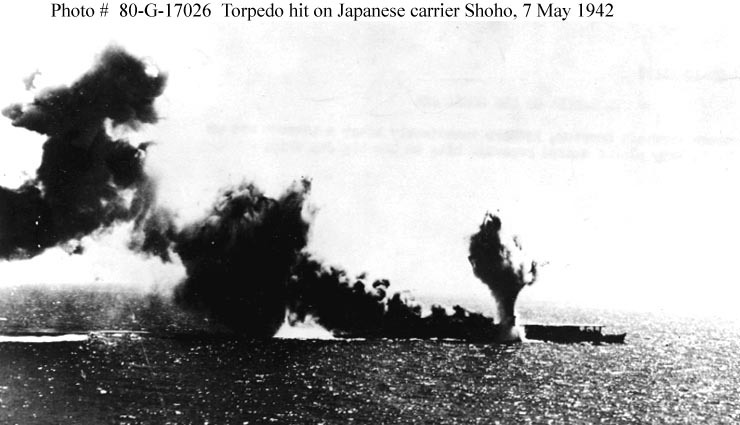 Japanese aircraft carrier Shoho is torpedoed, during attacks by U.S. Navy carrier aircraft in the late morning of 7 May 1942. 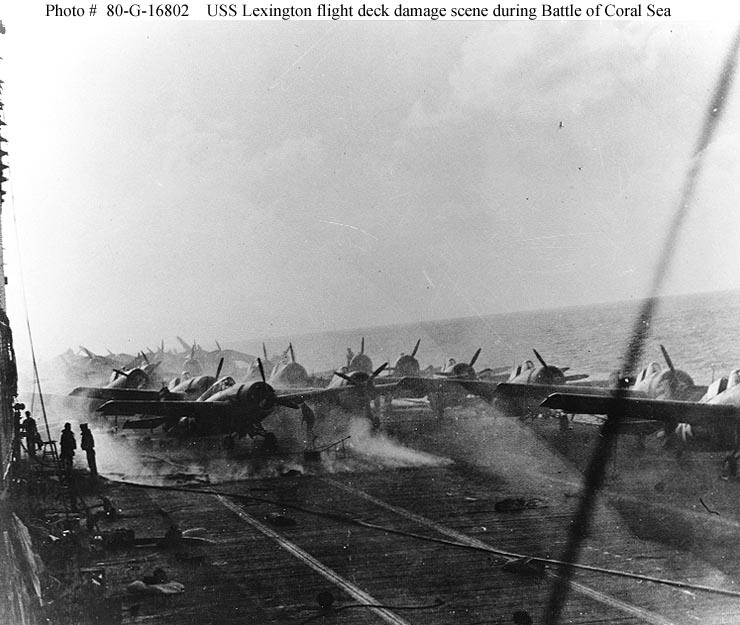 Photographed from a USS Lexington (CV-2) plane. 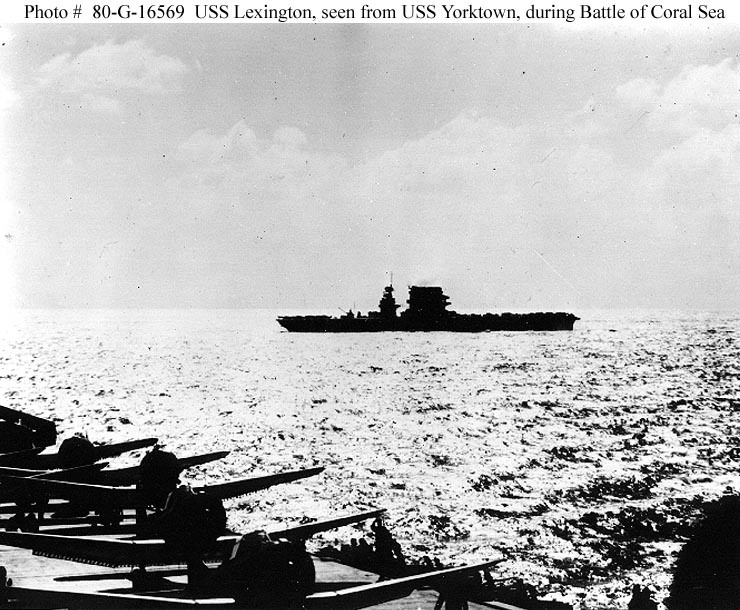 USS Lexington (CV-2) during the action, seen from USS Yorktown (CV-5), 8 May 1942. 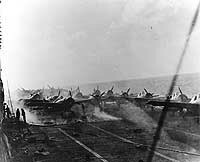 Large number of planes on deck and low sun indicate that the photo was taken early in the morning, prior to launching the strike against the Japanese carrier force. Yorktown has several SBDs and F4Fs on deck with engines running, apparently preparing to take off. 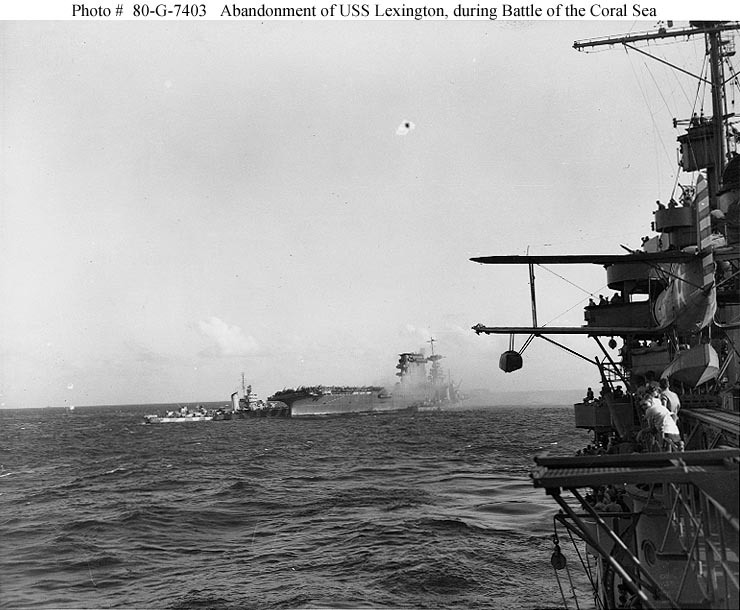 Lexington, whose silhouette has been altered by the earlier removal of her 8-inch gun turrets, has planes parked fore and aft, and may be respotting her deck in preparation for launching aircraft. 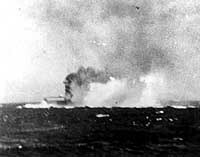 Japanese aircraft carrier Shokaku under attack by USS Yorktown (CV-5) planes, during the morning of 8 May 1942. 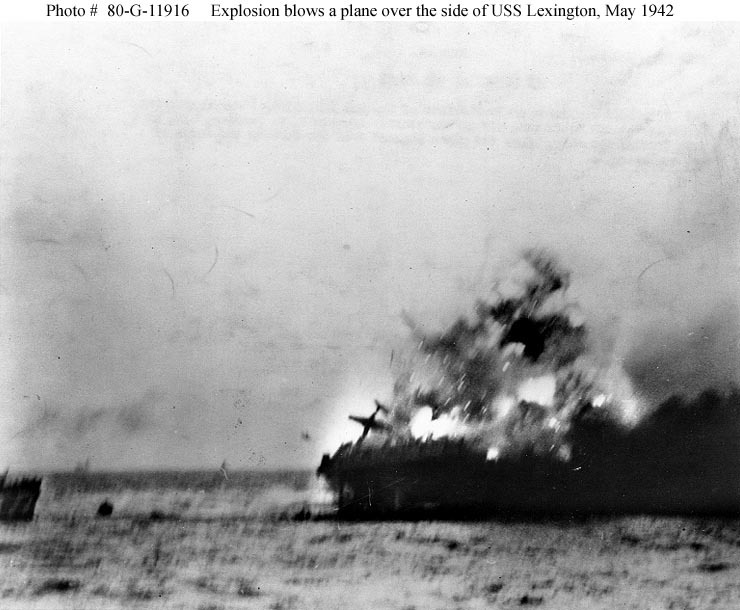 Flames are visible from a bomb hit on her forecastle. 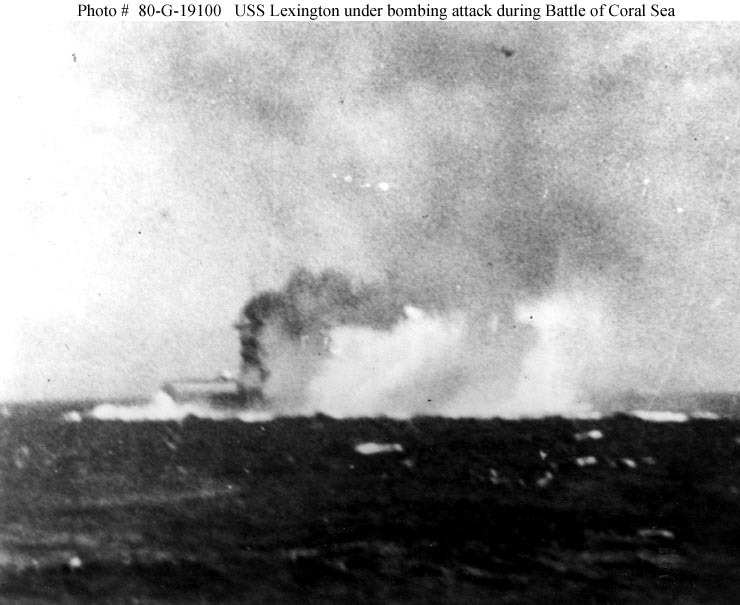 USS Lexington (CV-2) under Japanese dive bomber attack, shortly before Noon on 8 May 1942, during the Battle of the Coral Sea. View on the flight deck of USS Lexington (CV-2), at about 1500 hrs. on 8 May 1942, during the Battle of the Coral Sea. 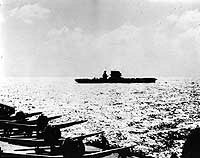 The ship's air group is spotted aft, with Grumman F4F-3 fighters nearest the camera. SBD scout bombers and TBD-1 torpedo planes are parked further aft. Smoke is rising around the after aircraft elevator from fires burning in the hangar. Note fire hose, wheels, propellers, servicing stands and other gear scattered on the flight deck. 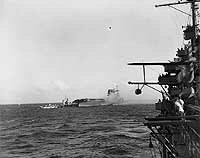 Destroyers alongside USS Lexington (CV-2) to assist in the carrier's abandonment, after she had been mortally damaged by fires and explosions during the afternoon of 8 May 1942. Photographed from a cruiser (probably USS Minneapolis). Note SOC scouting plane, with a damaged wingtip, on the cruiser's port catapult. This view appears to be cropped from Photo # 80-G-7413. Burning and sinking after her crew abandoned ship during the Battle of Coral Sea, 8 May 1942. Note planes parked aft, where fires have not yet reached.